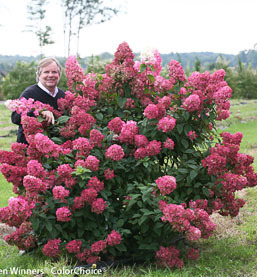 The Fire Light Hydrangea sets a new standard for Hydrangea paniculata. White flowers open in early summer on this strong upright shaped hydrangea shrub. As the temperatures begin to cool, usually in September, these white blooms on the Hydrangea Fire Light begin changing to pink almost red colors for its fall foliage presentation. Hydrangea Fire Light are hardy hydrangeas and will grow as far north as into zone 3 and heat hardy into zone 9. With its range, the Fire Light can grow in most any location. It's upright growth habit will mature in the 4 to 6 foot height range with an equal spread. You will want to space these gorgeous fall bloomers approximately 4 to 6 feet for an amazing summer to fall color show. The easy to grow Fire Light Hydrangeas will bloom on new wood so should be pruned or trimmed in late winter to early spring. Plants shipping to AZ and CA addresses will be bare rooted.